HR outsourcing can take many different forms. From using an outside firm for a single element of the HR process to entering a co-employer partnership with a PEO, the approach you take depends on the needs of your company and your reasons for outsourcing. What does the relationship with each provider look like? Do they offer the same services? In this post, we’ll address those questions by taking a look at the pros and cons of a PEO vs. an ASO, and then we’ll address the Big Difference between the two. PEOs handle your full range of HR tasks and processes, including payroll, compliance, safety, risk management, recruiting, training, and more. They can assist with onboarding, answer employee questions about benefits and withholdings, and manage workers’ comp claims. You retain decision-making power and responsibility for the operation of your business. ASOs manage many of the same HR tasks and administrative operations that PEOs do, but they do not usually offer benefits coverage or workers’ compensation insurance. They will, however, assist you in securing coverage and in some cases they may offer coverage through the ASO for an additional fee. 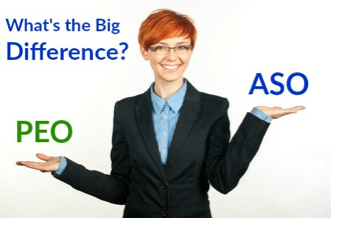 What is the primary difference between a PEO and an ASO? Here’s the Big Difference: A PEO becomes the employer of record. An ASO doesn’t. When you partner with a PEO, they essentially become your co-employer. They will file taxes under their Tax ID number, assume responsibility for compliance, and share the burden of risk. In many cases, they can also offer better insurance rates based on economy of scale. PEOs make a good fit for small to mid-sized businesses that can’t support an internal HR staff or that need the expertise of an external provider for regulatory and legal issues. By freeing up internal resources, PEOs help smaller businesses focus on their core competencies, giving them the freedom they need to grow.